Kat's 9 Lives: What's Up With Me These Days! For some reason I am just sick of a lot of food these days. I am regressing back to what I ate in the old days. I keep going to all these chain restaurants that I haven't been to in a long time. I guess it's a cycle, after a few more chains I will probably be back to trying everything new! Today for lunch we decided to go to CPK, California Pizza Kitchen. I mean these chains are there for a reason, they must be doing something right to be craved by others. 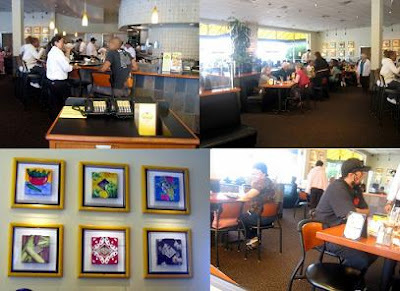 Most CPK's have the same outer and interior decor, a classic earthy atmosphere. It was super busy for lunch, definitely a family restaurant. I heard a woman say that the Shrimp Scampi Pizza was to die for, and I thought to myself that I should try something new some time. Unfortunately, I don't think I should listen to the opinions of others unless I trust their taste! The menu was different from what I am used to, and they keep changing the types of pizza they offer. They no longer offer the yummy Peking Duck Pizza and Rosemary Chicken Potato Pizza that I loved. =*( The Shrimp Scampi had shrimp, mild onions, roasted garlic, Mozzarella cheese, fresh oregano and parsley in a white wine lemon-garlic butter sauce. It might sound good on paper, but I think it fell short in taste. I asked for extra garlic and they did put a lot, but I didn't feel any wow factor and it was a little bland. Their was a lot of shrimp, but I felt it was a little rubbery. Luckily I decided to stick with one of my old favorites, the Santa Fe Chicken Pizza. It's grilled chicken marinated in lime & herbs, caramelized onions, Mozzarella cheese, and cilantro topped with salsa, sour cream, & guacamole. I love the mix of flavors! Before I eat the pizza, I smother the toppings evenly so that every bite is packed with a kick. The chicken was tender and flavorful. All the ingredients perfectly complimented each other. All in all the food was good and consistent. I really like the honey wheat crust that's not too soft and moist. The service was decent, I wasn't too thrilled about the hostess. We went to the location at Laguna Hills Mall, I think it's better than the one in Mission Viejo. The pizzas range from $11 to $13 and they fill you up. I don't know if they are quite worth the price, but once in a while I will have a craving and stop by for some pizza.